In one of our previous articles, we touched on mobile app wireframing and outlined three easy steps to design a basis for a mobile interface. Today we’ll tell you how to apply the same scheme to the process of creating wireframes on a website and we review the seven best tools to use in website design wireframing. What is a wireframe in web development? A wireframe in UX/UI design is a detailed plan of a website which allows you to focus on the structure and design interface on the conceptual level, before you start with the graphic implementation of your ideas. A well-thought-out wireframe can be a great basis for a website layout in which your future design will take place. Each wireframe consists of multiple elements, the number of which is defined by the number of reasons. The type of company, its requirements, and the website owner’s involvement can all place limits on the level at which you need to specify the web design wireframe. What are the user goals when interacting with this page? How can the content be organized to support these goals? What should the user see first when arriving at the page? What will the user expect to see in the other areas of the page? Where do you put images and what size? What do competitors place on their websites? As you can see, not only do website elements themselves matter when you design wireframes, but also user experience, which determines the elements that will be approached first, the locations where the visitors visit next, and what they may not need at all. What’s next? Well, we wouldn’t call it the next step, rather, this should be a set of iterations of brainstorming and sketching, with each iteration followed by the client’s approval. After the stage of generating ideas comes sketching. The first way to start designing your wireframes is the simplest one; you take a pencil and paper or a piece of chalk and a blackboard. A sketch is low fidelity but its simplicity gives you a raw overview, and its static character allows you to focus on the user experience and to consider the user flow. Choose appropriate tools (see our list below). Review the content once again to edit details based on the emerging requirements. Design a grid with layout elements (sections, cards, buttons, tabs etc.). 7 best tools to use in website wireframing. Balsamiq allows you to create wireframes that clearly reflect user flows you expect; the wires look visually distinct enough from final mocks; it is pretty fast and intuitive.The great thing is that it can be a good fit, both for sketching, which conveys a raw variant of design, and for a fully functional click-through prototype that simulates user flow. However, the tool has some limitations in terms of flexibility when you need to tailor a sitemap in detail, so it is more popular among business analysts or clients than among designers striving to create high-fidelity wireframes. While most of the wireframing tools are overloaded with excessive features, with 70% of them being never used by designers, Axure is a laconic and at the same time exhaustive tool intended for high-fidelity wireframes. Agente prefers it because of its dynamic nature, its support of complex conditional flows, and its adaptive views, as well as the option to test usability on any device. Adobe Indesign is one of the many well-known tools from Adobe. It allows you to create web, mobile, and even printed projects and integrate them with the other Adobe utilities, such as Illustrator or Photoshop; it is part of Creative Cloud where the other assets of Adobe products can be stored. 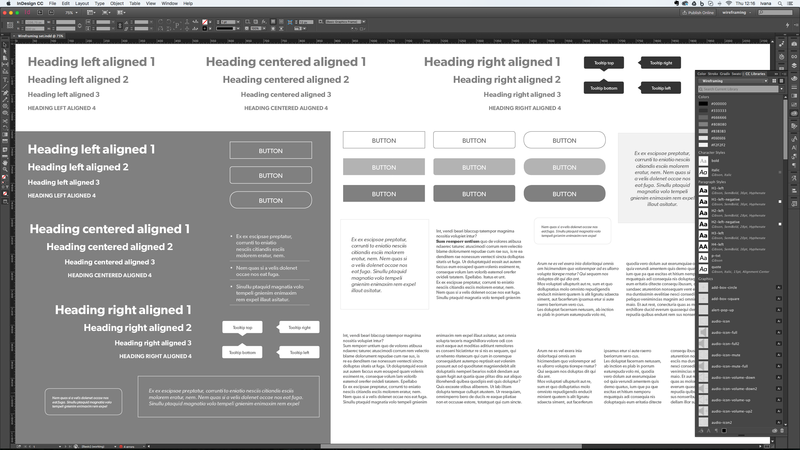 We suggest UXPin for wireframing websites that require lightweight interactions. It supports Photoshop and Sketch files and enables the user to build screens out within the tool itself, with the help of robust UI libraries. With Mockingbird, you can create projects within a simple drag-and-drop interface. It allows users to quickly design mockups, and is great for high-fidelity mockups thanks to its widgets such as video plugins, volume sliders, map integrations, navigation arrows, and others. SimpleDiagrams is tailored for sketching and low-fidelity wireframing. While appearing quite primitive, it still supports import and export of templates, drag & drop, multi-user collaboration, and flowcharts. Conduct thorough research before you start drawing sketches. Don’t overload your wireframe with a lot of information, start with low-fidelity mockups. Use tools as a helping hand at each step of wireframing, sometimes you can limit yourself to a pencil and paper. Test assumptions after each iteration and wireframe again. Seems like the process is not done after wireframing? Right you are! That’s were prototyping comes into play. Follow our blog to read about prototyping in one of our next articles and drop us a line to learn more about wireframing.